Forget the oil and no need for eggs or dairy! 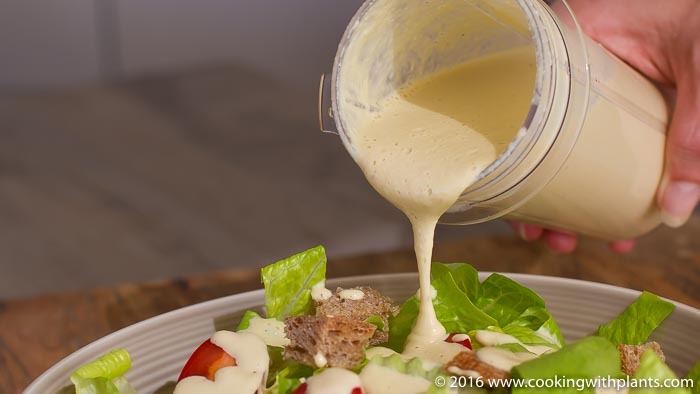 This is the best vegan caesar salad dressing recipe you will ever taste. So rich, creamy and super delicious, it will make any salad taste amazing. Also great over potatoes and pasta. YUM! Im definitely trying this one! How long will this keep in the frig? Hi, Anja! This dressing is delicious! I love it! Just wondering how long you would say this lasts in the fridge! Thanks for the great recipes! It’s delicious!!! Thank you for the recipe!!! Wow I never thought it was going to be that good. Thank you so much for sharing, it is so yummy. How would I replace cashews with silken tofu? Just 1 cup of tofu? 🙂 Thank you! Maybe try a half cup first and adjust to your taste and preferred consistency. Or could we put a white bean in place of cashews?? And I thought I was in love with the Parsley/Avocado dressing but I think this is just as fabulous too. This look SO GOOD. What might work as a non-nut, non-soy substitute for the cashews? What about replacing cashews with roasted walnuts. Sorry Johnathan… I don’t count calories anymore since losing weight and just eating whole food plant based. Anja, shall I change something if I use soaked cashews? By the way, we miss your posts! I didn’t have any cashews so I substituted macadamia and almonds . It still tasted fantastic! Anna looking for your potatoe lasagna recipe someone mentioned. Do I need to,soak the cashews? I don’t soak mine… but if you don’t have a very powerful blender it will help. Hi Anja! Just discovered you and would like to try this recipe first, but wondered if the nutritional yeast is important. Can I add a little oat bran or something else to take its place if thickening is the goal? Thank you! Hi Brian. Welcome. The nutritional yeast is for flavor not thickening. You can leave it out or maybe use a little bit of white miso paste in its place. I’m 4 months new to this whole vegan thing (large polyp on my large colon inspired me), so I couldn’t imagine nutritional yeast would ever be added to anything for its flavor! 🙂 But I’ll get some and do the recipe by the book. Can always use more B vitamins. Just finished making this dressing with all of the listed ingredients. Now I understand why the nutritional yeast is in there for flavor. My wife agrees the dressing is wonderful! Can’t wait to put it on the salad tonight. I’ve been feeling a bit deprived as a new vegan, however it’s recipes like yours that will help me not miss my old foods at all! And so simple too. Easier than my old Caesar dressing. Thank you so much. No sorry, I don’t count calories. I just eat whole plant based foods and avoid added oils. Looks so good. Would you suggest soaking the cashews before using? Wow….closest recipe to my old one with oil…..this is amazing. Made it tonight. Love it! Simple and perfect creaminess and garlic flavour. Thanks! Thank you for the recipe! Is there someplace the nutritional values are located? All your recipes are amazing and I think I’ve made nearly everything. 🙂 Thank you. Thanks Moira… glad you like it as much as I do and the modification sounds great! What do you tell someone who eats a whole food plant based oil-free diet, walks (but doesn’t exercise enough), genetically has a gene in my liver that produces too much cholesterol, hence I had a few stents in my heart, and 5 days ago I had a heart attack. Now I feel great now but felt great before the heart attack which I attribute to my clean diet. I do drink socially but never at home. I even teach and help others to eat a WFPB oil-free diet. Needless to say, I’m so upset that I can help others but not myself.